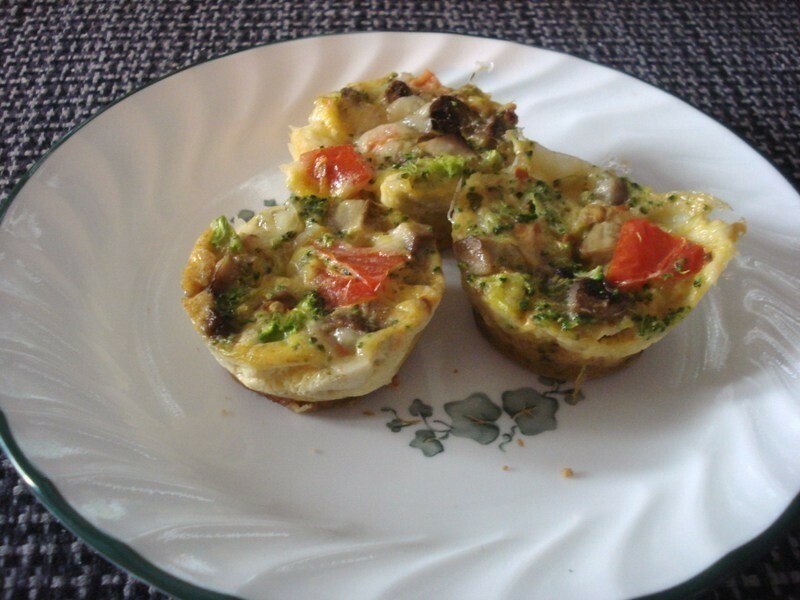 Cute, healthy and fairly quick way to make little breakfast tarts. My kids even loved them and wanted more. They'd also be great for breakfast buffets if you have company over. BUT... here's what they look like, and the ingredients and instructions. :) Enjoy! First, you want to prep your muffin trays. If you use silicone ones like me (this is how I did mine in the microwave! ), so much the better because the egg won't stick! Otherwise, you may want to grease or butter all your tins first. Then, use the teaspoon to spoon a thin (1/4"-ish? ), even layer of breadcrumbs into the bottom of each tin. That's done, now we move on to the ingredients. In your bowl, crack open all four eggs, and add the milk... and beat that up a little. Then once all your other ingredients are adequately chopped and/or diced and/or minced, put everything else in there and give it a good mixing. Add salt & pepper to taste. Now we're going to put it in the muffin tins but I'm going to give you a quick tip: Because the ingredients tend to fall to the bottom of the bowl, simply pouring it into the tins didn't seem to work - I found it easier to spoon it out so that each tart gets a fairly even amount of veggies/etc. in it, and then poured the remaining egg mixture over each one until they were all even and the mixture was gone. Let them sit while you set the table or clean up your prep tools, etc. This will allow the egg mixture to seep into the bread crumbs and sortof... seal the "crust". I am drooling, they look so good and they are microwaveable! ♥ ♥ ♥!